A drug bust in North Carolina show how far the tentacles of Mexico’s drug cartels reach into the United States, a report said. A heroin ring operated by a Mexican cartel was recently busted in Rowan Country, more than 1,500 miles from the U.S.-Mexico border, Judicial Watch noted in its Corruption Chronicles blog on Feb. 8. Rowan County Sheriff’s Office authorities said they began targeting a large scale heroin distribution ring in 2013. The investigation found that a Mexican heroin trafficking ring based in the Charlotte-Matthews area had been supplying heroin to Rowan County for more than 10 years, with some transactions involving quantities of up to $10,000 worth at a time, WXII-12 News reported on Feb. 2. Related: Do the math: Use Mexican drug cash to pay for the wall, Jan. 29, 2017. “In the last few years Judicial Watch has reported extensively on the massive amounts of drugs — especially heroin — that get smuggled into the U.S. by Mexican traffickers who later use street, prison and outlaw motorcycle gangs to distribute them throughout the country,” the Judicial Watch blog said. 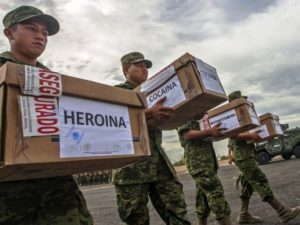 A government assessment disclosed that there are at least eight major Mexican drug trafficking organizations operating in the United States with the Sinaloa Cartel being the most active, the Judicial Watch report said, adding that heroin is the most popular drug and is entering the U.S. through Mexico in record numbers. A report published late last year referred to western states as a “heroin transit zone” with Mexican cartels moving large amounts of drugs through the Southwest border. Federal arrests and prosecutions of heroin traffickers have skyrocketed with 6,353 heroin-related arrests in 2015. The number of individuals sentenced for heroin trafficking offenses in federal courts has increased by almost 50, the government confirms. More than 50,000 Americans died from drug overdoses in 2015, the most ever. A big part of the problem is that the drug trafficking is being leveraged by corrupt public officials in the U.S., a years-long Judicial Watch investigation has found. “Undoubtedly, cartel violence is real but truckloads of drugs are getting across the country because U.S. officials at the municipal, state and federal level are turning a blind eye or actively participating and cooperating with cartels,” Judicial Watch said.